A big congratulations to all of the finalists who competed in the Eddie’s Spelling Bee! 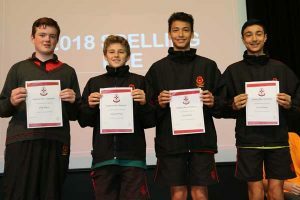 The Grand Final was held during the school assembly last Friday when Artemi Lomis (Year 7), Michael Holmes (Year 8), Kai Wheelock (Year 9) and Caolan O’Dwyer (Year 10) battled it out to see who would be the 2018 Spelling Champion. It was a great effort by all the boys, however, Caolan took out the title. Well done Caolan! 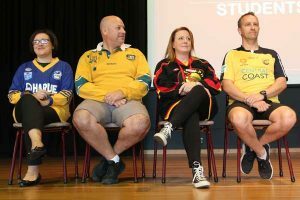 This was followed by the much anticipated Teachers v Students Spelling Bee, where our Year 12s battled four brave teachers. This is a much loved (often controversial and generally contentious) event. Mrs Murdoch, Mr Brown, Mr Foster and Mrs Evans stepped up to take on some of Eddies finest spellers; Tom Kennedy, Alejandro Murdoch, Nicholas Haughain and none other than our Captain, Adam Bing. It was a valiant effort by all, however, it was the teachers who were victorious in the end. 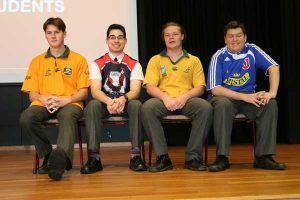 I would like to commend all of the senior students involved in the Academic Portfolio for organising such a successful event that was fun, supportive and really engaged the whole school community.